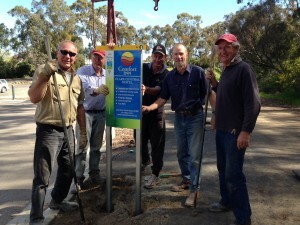 Thanks to the continued efforts of the Riesling Trail Committee we now have a number of new signs along the trail. The signs provide information about Riesling Trail Business Partners that help the committee maintain and improve the Riesling Trail – please support them! Please see the membership page if you would like to promote your business and support the Riesling Trail. Posted in Along the Riesling Trail. Cycle the Riesling Trail stress free, with bikes, accommodation, food and wine, and transport all included. Contact Tour de Vines on 1300 665 330 or email inquiry@tourdevines.com.au to find out more.